An organiser reflects on the conditions that led to tenants in East Hamilton declaring a rent strike. This post previously appeared on North Shore Counter Info and It's Going Down. “Alright, so show of hands, who is committed to a rent strike starting May 1st?” There was a slight sense of apprehension in the air. I could sense it from where I stood in the back corner. Even for those committed to a strike, the question loomed large as to who else was going to raise their hand. After all, for this type of thing to be successful, it has to involve working class people coming together and having each other’s backs – acting collectively. And, as it often goes, it only took two, then three, and then four people to raise their hands, until the whole room was filled with raised hands. A sense of relief and excitement filled the four walls of the community centre meeting room, punctuated by the sounds of laughter, chatter, and bouts of clapping. “Okay then! CLV isn’t going to know what hit them!” Cue the full applause. For over two years, The Dominic Agostino Riverdale Community Centre has been the chosen meeting spot for tenants living in a group of four neighbouring apartments called the Stoney Creek Towers. It is at this community centre that neighbours come together to discuss shared issues and grievances; to build relationships of solidarity; and to build strategies of collective resistance that improve the conditions of daily life for tenants. Hand-in-hand with organizers from the tenant-run, city-wide Hamilton Tenants Solidarity Network (HTSN), the Stoney Creek Towers Tenant Committee (SCTTC) has been a significant source of collective power for renters who are forced to face the dominant economic interests of CLV Group, and a large faceless Real-Estate Investment Trust called InterRent. The story of tenants facing poor living conditions in Hamilton, while the economic interests of businesses and investors are well-served, is not a new one. On a surface level, it’s hard not to notice some of the massive and alienating changes taking place in our neighbourhoods in the downtown core – as fancy cafes, shops, and restaurants cater to the tastes of an emerging demographic of hip and wealthy clientele. Posters and stickers splattering the city with slogans of “Go Back To Toronto” and “Steal all The New Art” are a telling response to these trends. Working class tenants downtown face rising rents and a restrictively expensive cultural landscape. We’re right to be offended and worried. But we’d be left fairly powerless to challenge these changes in any meaningful way if we focused only on the pressures of consumption associated with the tastes of the hipster clientele that has been lured into Hamilton. It’s important to note that some deep structural forces are behind these changes in our neighbourhoods and our rents. Compelled by the logic of capital accumulation, the owning class by nature seeks strategies for ever greater returns on investment, and our homes and communities do not escape its reach. The process goes something like this: deteriorating urban areas (that were historically neglected during a bout of investment and growth in suburban development) are subject to reinvestment in cases where it is decided that a big enough gap exists between the rents being paid by working class tenants, and the higher rents that could be collected from wealthier tenants in a “renewed” neighbourhood. The result of this process? Working class people, families, and communities are gutted and displaced from their neighbourhoods, and private wealth is generated for investors, developers, landlords, and businesses. Of course, this is an uneven process, and it expands outside of the inner city core, too. The tenants of the Stoney Creek Towers live in the East Hamilton neighbourhood of Riverdale, where many working class people and families have been pushed in search of more affordable rent. Many of these tenants are newcomers. Many tenants struggle to live on the diminishing shreds of state-supported incomes that sustain poverty. All of the tenants share similar material struggles. As InterRent and CLV seek to secure ever greater returns for investors, tenants face an upward pressure on their rents and a hostile outward pressure from CLV, who use every dirty tactic to push people out so they can open vacant units. Of course, vacant units mean even higher rents for the new wave of tenants that the landlord is trying to attract. Leaving units in disrepair, encouraging the deterioration of living conditions, ignoring work orders, bribing existing tenants to move, and plain harassment are some of the primary weapons in the landlord’s class war arsenal. 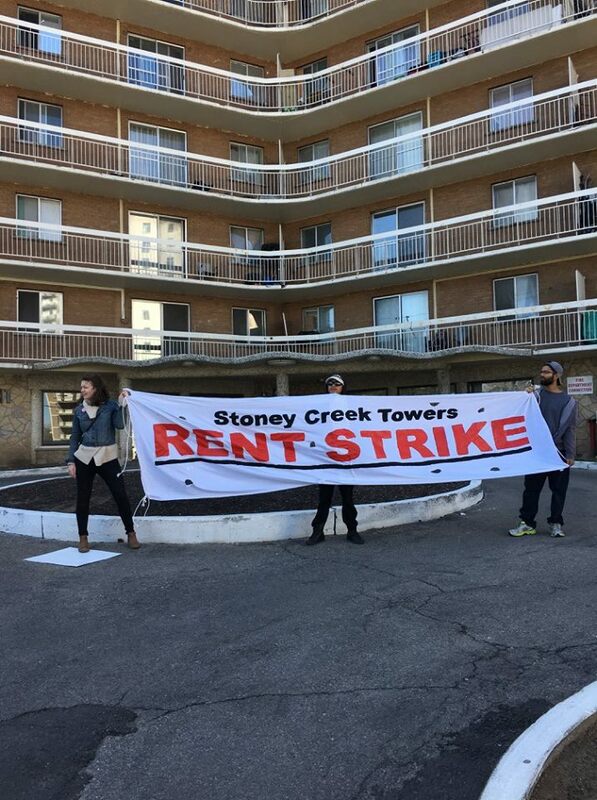 Under fire, tenants packed into a mass meeting organized by the Hamilton Tenants Solidarity Network (HTSN) and The Stoney Creek Towers Tenant Committee (SCTTC) on April 24th to discuss their next move: a rent strike. After hitting the halls and knocking on every door in each of the four buildings, members from the SCTTC and the HTSN gathered together with a mass of fellow tenants to hammer out a plan that would bring the collective power of tenants to bare on the landlord. Tenants were emboldened by stories told by organizers from the Toronto neighbourhood of Parkdale, where two rent strikes successfully beat back AGI’s. But perhaps even more important, they were emboldened by their shared material conditions as working class tenants facing the forces of displacement, and by the hard work of tenant organizers who have been doing the long-term work of building relationships, connecting the dots between people’s struggles, and confronting divisions between tenants that the landlord thrives off of. It is this work that has put working class people in Riverdale in a position where they are able to exercise their power through class solidarity in the form of a rent strike, and it is only through continuing this work that this battle can be won. Most of the tenants at the Stoney Creek Towers remain rooted to the neighbourhood and community where they live, where they are tied to a social fabric of life, where their kids go to school, and where many of them have struggled to be able to afford the cost of living. In these ways, this is a localized struggle. But, significantly, this rent strike is also a struggle that reflects the similar situation of working class tenants across the city, and as such it holds the potential to open up meaningful avenues for struggle against gentrification, displacement, and capitalist class war offensives, beyond the territorial boundaries of Riverdale. To a great extent, this can be facilitated by the city-wide scope of the HTSN, but much more than that, it is an example of a collective response that has seen and will hopefully continue to see broad participation and solidarity that will only serve to inspire the courage and know-how required for working class resistance to spread.